Menorca is known as the island of 7 lighthouses. The lighthouses are one of the most representative symbols of the island. There were built in order to provide safe sailing because over the centuries, violent storms off the shores have caused numerous shipwrecks. The lighthouses were strategically positioned and were providing safety for many years. The oldest lighthouse was built in 1857. At the end of the season I managed to see the ones I hadn’t seen before. Today I want to present you all seven lighthouses! This is the lighthouse that I could actually see every day from the hotel. It was the closest lighthouse to the area where I was working. I went there by bike or on foot several times, I also saw it from the sea during the catamaran excursion and I watched its lightning at night. It just formed a part of my life in Cala’n Bosch, especially with the setting sun over Mallorca as well as the lighthouse! 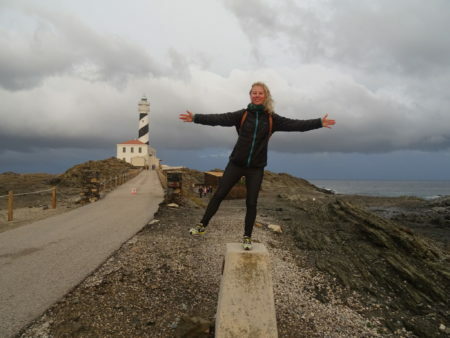 Artrutx lighthouse stands 45 metres above sea level and is 34 metres high. Its lamp can be seen in 19 nautical miles away. Today, the old lighthouse buildings have been converted into a restaurant. It was built in 1859. It was at run on olive oil and then on petrol. The original tower was much shorter than it can be seen today. The height was increased in 1969. With the automation of the lighthouse in 1980, the unused keeper’s accommodation was later converted in a café and restaurant, providing food and drink to the patrons who visit to watch the sunset from the terrace. The lighthouse can be visited when the restaurant is open but the tower is closed. In 2005, the lighthouse was included on Menorca’s list of historical buildings. 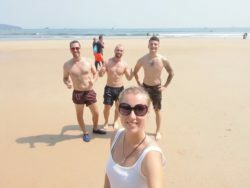 I visited the lighthouse with my Slovak friend that came for visit. 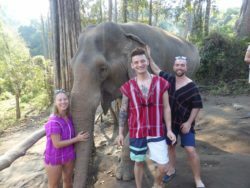 It was a half day trip and we really enjoyed it. It’s a beautiful place with stunning views. Not far from the lighthouse, there is a beach of Cavalleria which is also recommended to see. 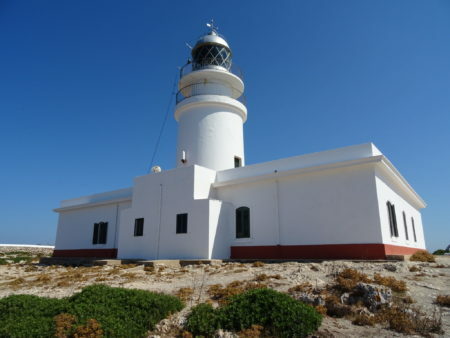 The lighthouse is situated at the top of the headland of Cavalleria and it’s the most northernly point of Menorca. It’s a good place to watch the summer sunsets. The white tower of the lighthouse is 15 meters high and it was built on the island’s tallest and most impressive cliffs. It stands 94 meters above sea level. Just few meters from the lighthouse there is a free parking where you can leave your car. Then you can just walk around and enjoy the spectacular views. Near the lighthouse there is a small cave where you can enter. Before the Cavalleria lighthouse began to operate in 1857, over 700 shipwrecks had occurred on this part of the north coast of Menorca since the 14th century. Even after the opening of this lighthouse, this coast was still dangerous and that’s why two more lighthouses were built at the beginning of the 20th century – Favaritx and Punta Nati. I visited Punta Nati twice. First time was last year with my Cuban friend. This year I also had an opportunity to go there so I was glad I got to see it again. For me, this it the best lighthouse on the island. It’s different than the others, in my opinion, it has its own magic. It’s just hard to describe. It feels like you’re in the middle of nowhere, you’re surrounded by rocks, stones and the sea. Even though you can’t actually enter the lighthouse area, it’s definitely worth coming there and walking around. There is a parking place nearby. When you drive, go slowly because the road is very narrow. The lighthouse is situated 6 km north of Ciutadella. The tower is 19-metre high.. 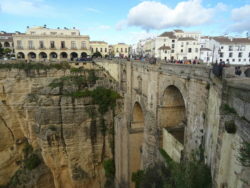 It stands 42 metres above sea level, in a landscape known as dry Menorca. The lack of build up areas has permitted the survival of endless dry-stone walls that are interrupted only by shelters built from dry stone where cattle can hide. The headland is an excellent place for wonderful sunsets, with Mallorca in the background on the horizon. Punta Nati was built in just over a year due tu the pressure from the French government after the wreck of the steamship in 1910. The lighthouse was opened in 1913. It started using lamps powered by petrol gas, but in 1921 they installed a non-automatic lamp powered by acetylene gas. This lighthouse was the one that I didn’t want to miss. Last year I didn’t get there so this year it was my plan to visit it. During the high season it was quite complicated to reach it since it was forbidden going there by car. To see it meant to take three buses there and three buses back (from Cala’n Bosch to Ciutadella, then another one to Mahón and the last one to Favaritx). Because of that I decided to visit it at the end of the season when it will be accessable by car. When I finished the season, everything got complicated – it was raining all day long and we didn’t have electricity for three days. I was honestly afraid that I won’t be able to go there. 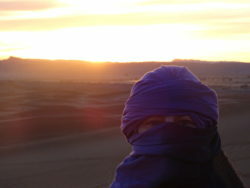 I was lucky though, two days before my departure it stopped raining so I went there. Favaritx is also kind of different than the other lighthouses. In Menorca they always say that it looks like on other planet. Favaritx lighthouse is located over 17 km from Mahón. Its tower is 28 metres high and it stands 47 metres above sea level. 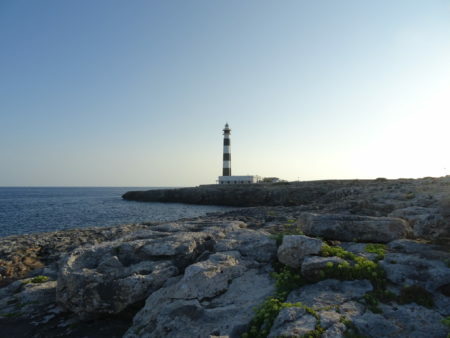 The lighthouse is the first such construction made from concrete erected in Balearic islands. Because of the harsh lunar-like nature of its surroundings it makes it one of the most visited lighthouses on the island. The headland is remarkable for its strangely shaped black-coloured rocks and its scant plant cover. The shipwrecks that took place in the 20th century motivated the construction of the lighthouses on Punta Nati and Cap de Favaritx. Like that it completed the illumination of Menorca’s north coast. The works on the lighthouse began in 1917 but because of a lack of funding and problems with the land ownership, it wasn’t finished until 1922. The lighthouse wasn’t electrified until 1971. I saw the lighthouse many times because it’s close to Ciutadella, it’s situated near the entrance to the old port. I actually got closer to it last year when I went to Cala en Blanes with my Cuban friend and we were driving along the coast just near the lighthouse. The lighthouse lies close to the seaward entrance of the port of Ciutadella on the Sa Farola point. On the opposite site is the Castel de Sant Nicolau, a 17th century defence tower. The lighthouse’s tower is 13 metres high and stands 21 metres above sea level. The work on the lighthouse began in 1861 and it started to operate in 1863. It has been remodelled on a number of ocassions and, for example, over the years its tower has been extended and a protective wall has been built. The wall was made as a defence against the sea, which would flood the lighthouse and its buildings during the storms. It became the first lighthouse in Menorca and the forth in Balearic islands that was electrified in 1918. This lighthouse and the Illa de l’Aire I got to see when I was leaving Menorca. Since I took a ferry from the Mahón island, I could get stunning views of the Menorca’s coast and I could see the last two lighthouses of Menorca that I was missing. 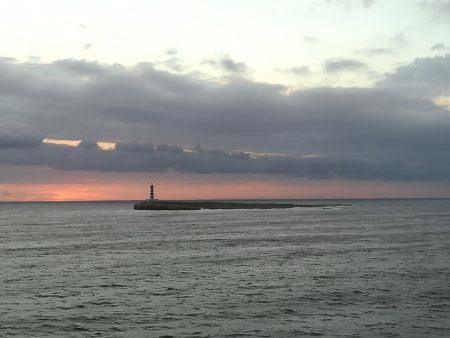 Sant Carles lighthouse is located at the entrance to the Mahón port. It’s 10 metres high and it stand 22 metres above sea level. Sant Carles opened in 1852 and it was built inside military installations, where the remains of the castle of Sant Felipe are situated. The original lighthouse was demolished because its obstruction of firing practice of the nearby military gun emplacement. In 1912 its old lamp was turned off and replaced by a mobile lantern attached to a folding davit. 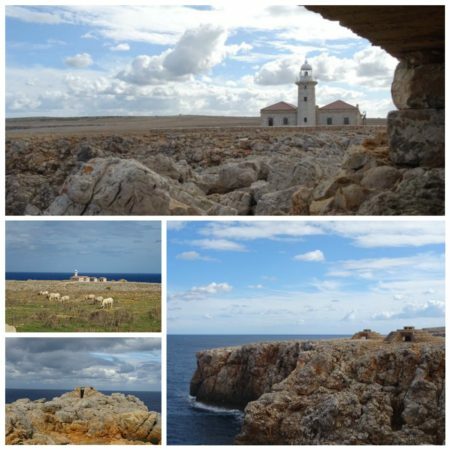 Despite the multiple changes that this lighthouse has suffered, it can be considered the oldest one in Menorca. This was the lighthouse that I was saying my “goodbye to the island” to. It was the last part of Menorca I could see and it felt quite strange. Leaving the island after my second season there wasn’t easy. 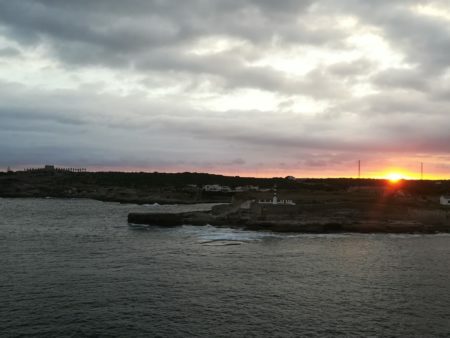 Fortunately, the sun setting over the lighthouse together with the wonderful views of menorquin coast, including the fortress La Mola, made it special. It was like a cherry on top of the beauty of this amazing island. The lighthouse is situated on the highest point of Illa de l’Aire, a small uninhabited island. 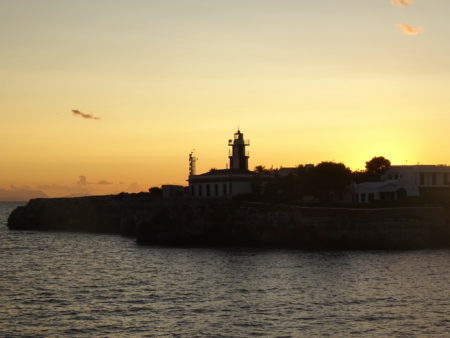 This is the tallest lighthouse of Menorca with its 38-metre high tower. Inside there is a spiral staircase with 165 steps. The lighthouse stands 53 metres above sea level. It can be seen from the nearby beach Punta Prima and if you wish to access it, you should take a boat taxi. It was built between 1857 and 1860. In 1911 its original oil-fired lamp was replaced by a kerosene lamp, which was in turn replaced in 1974 by an automatic gas lamp. This meant that from 1976 the lighthouse-keeper didn’t have to live in anymore. In 1995 the light was changed again for the system using photovoltaic energy. 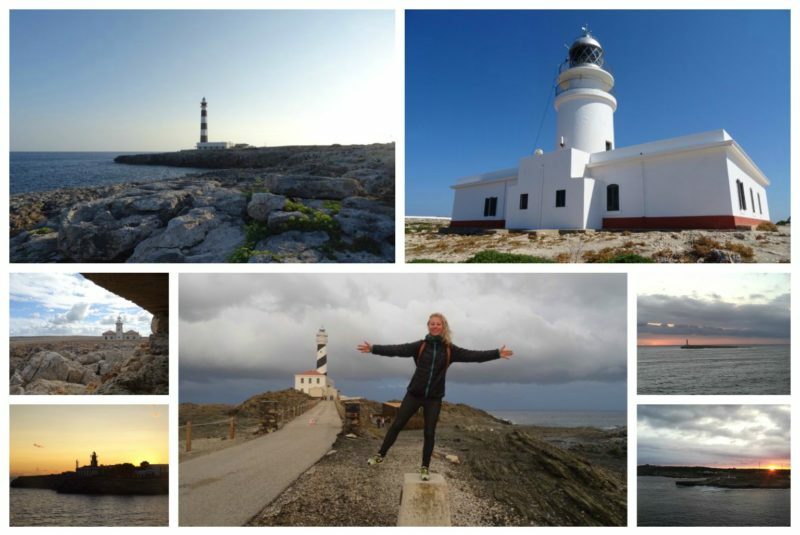 Today you got to know every lighthouse of Menorca island. Are you ready to take a journey through the island and to see each of them?